With only two-weeks until the very first DX Seminar event, taking place on September 27th, we are excited to formally introduce our second speaker, James Bradley, Director of Sales - Australia and New Zealand for global technology leader UiPath. Alongside Anthony Scott James will be sharing his knowledge and experience at the September event, giving attendees the practical knowledge needed to hero the conversation for Robotic Automation within their organisation. Part of a global network of technology leaders and users, James is in a unique position to share an exciting presentation. 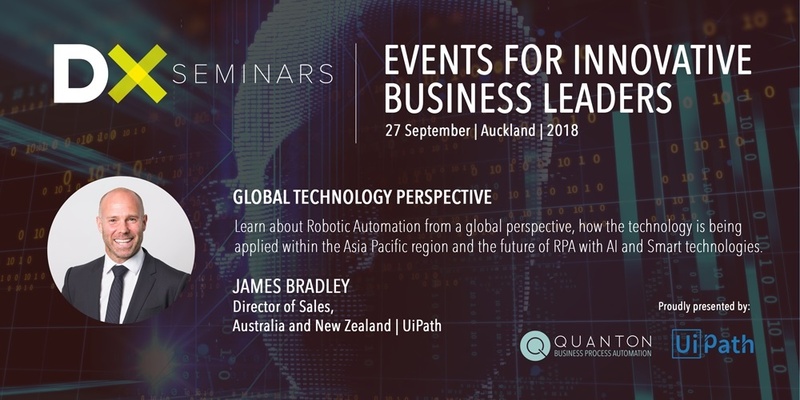 Addressing three key topics James will discuss how Robotic Automation is growing globally, the impact of Robotic Automation in the Asia Pacific Region and the future of automation with Artificial Intelligence (AI) and other smart technologies. In his current role James focuses on representing Australia and New Zealand to help UiPath understand the local market and emerging needs. Central to his role is a focus on developing the partner and channel ecosystems to deliver the right level of capability and high-quality experience for customers. UiPath is recognised as a leading global Robotic Process Automation technoogy platform. Adding to the excitement of James' role, UiPath was rated highest overall of all Robotic Automation technologies assessed by Forrester Wave™: Robotic Process Automation, Q2 2018 and received an award for Outstanding Achievement in the Use of AI at the 2018 CognitionX AI Innovation Awards. With a technology career spanning twenty years, James has developed extensive experience working with automation. Throughout his career James has been both in and around automation giving him a great breadth of experience which now combines data, software and predictive analytics; he has deep holistic experience supporting financial services across over 100 projects in major banks automating (among other processes) lending origination and debt and fraud processes. James has worked in a variety of other sectors including telecommunications and utilities and his roles have taken him around the world with engagements in Australasia, Europe, South East Asia and Africa creating a diverse understanding of customer needs with a global perspective of best-in-class approaches to automation. According to James, Automation is a very familiar concept to enterprise organisations who have been using tools to process structured data for decades. "what is changing is the nature of how we are automating processes and the speed of implementation." "The ability not only to automate processes with structured data but unstructured and semi-structured data to achieve meaningful business outcomes is what really excites me." 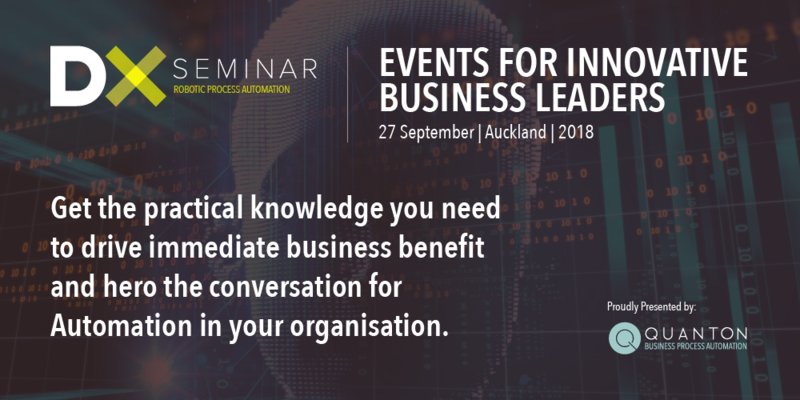 This is an exciting opportunity to benefit from a presenter with true global perspective and a strong local understanding, gaining practical insights on how global trends will translate to New Zealand enterprise. We are also now able to announce the final speakers in an already powerful line-up for the September event. Nick Townrow, General Manager - Robotic Process Automation for Downer Australia will be joining Anthony Scott alongside our local New Zealand presenters. Keep an eye out next week for our formal introduction to Nick.